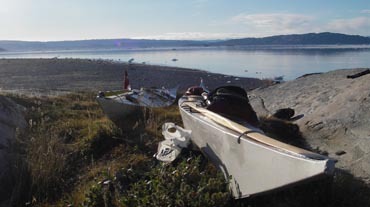 The West Greenland kayak is perhaps the most well known type of kayak. It's a well rounded trip and sea kayak, and most modern fibreglass and plastic kayaks are based on this design. The West Greenland kayak is also spacious enough for trips lasting mutiple days, while at the same time being short enough for precision maneuvering, play or eskimo rolls. The kayak lines are also important, just as the stability and seaworthiness are. It's a fast kayak, easy to paddle, and the first choice by far of the majority of those who want a frame on skin kayak. Weight: Approximately 18 kg. Length and width are tailored to the owner/buyer.